Besides gaming, automotive brands are using their magazines and social media to engage their owners kids as well. Audi USA provides a special ‘Audi kids’ space’ on their official website where visitors can download the A3 Cut-outs and also shop Audi collection. 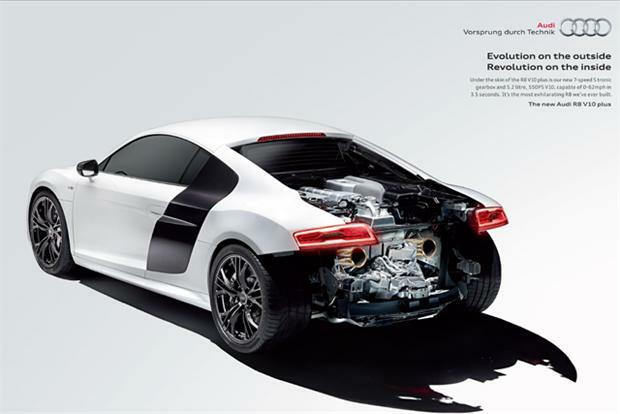 The cutouts can be downloaded as PDFs and also torn from the last page of the Audi Magazine delivered to the owners. Besides Audi A3 Cut-out, there is also a cut-out to appeal to the racing fans and engage kids by providing them with assets to tell their own story. BMW Brasil has an improved version to that of the Audi, where the car can be personalized in terms of the name, colors and wheels. All the user has to do is add a name and make the selection to generate an instantly downloadable PDF. Even though BMW Brasil provides a personalized cut-out version, it does not clearly specify which model it is. That is a missed opportunity to create some familiarity with the kids at a young age and already capture their minds. BMW Germany however adds additional value targeting probably 10 years and older with printable board games, student plans and coloring books. However, both the examples are interesting and simple providing the time-poor parents a quick take out. BMW also acts responsible here by not promoting their products only in gaming, to which many parents are opposed and add strict time tables to play video games, but also creating loyalty and expressing ‘Family Care’ in a very subtle way. This also helps them to tap into audience who will probably never play video games and not get enough screen time on TV, iPods and Tablets until after a certain age. BMW and Volkswagen are actively using user generated content and crowd sourcing to break away from the usual brand and product stories. I think it is spot on and about time that brands like BMW and Volkswagen, who have such a large and loyal base of audience, involve their fans and owners and give them a platform to express their ‘story’, their ‘experience’ and their ‘voice’. Technology today gives brands such a great advantage to involve their audience and leverage their voice to enhance brand campaigns. BMW’s global campaign called ‘BMW Stories’ and Volkswagen’s ’40 years Golf’ and ‘The Peoples Film’ campaigns are great examples currently in the automotive category involving a broad range of audience. BMW’s International website and most of the local market websites are running the ‘BMW Stories’ campaign. Owners, fans and enthusiasts are encourage to share what BMW means to them and how it is a part of their life, what memories they share with BMW and would love to share these stories, experiences & opinions. To make your story appear on the site, all the users have to do is add the hashtag #BMWStories to their content, which can be in the form of a video, quote or images shared over the key social networks currently Facebook, Twitter, Instagram and YouTube. The clever part of this campaign is that BMW is putting these ‘Stories’ where information on the other models is also promoted. Story telling aspect is not just left to the fans but BMW also actively participates in it. i8 model is used as a halo for the BMWi Range and they share interesting stories under the title ‘Pioneering Stories’ showing a range of films on the i8 model. Pioneering Stories even include the racing stories on ‘Alessandro Zanardi’ and a few selected behind-the-scenes, internal films and fans experience with the i8. There is a separate social stream for ‘Pioneering Stories’ which are picked up via an additional hashtag #pioneer in addition to the #BMWStories. After the BMWi range, the BMW X range is promoted aggressively with selected films focusing on ‘dynamic performance’. This is topped by an even exciting video going viral currently on the 2 Series Coupe M235i called the ‘BMW DriftMob’ – directed by the Hollywood stunt expert Mic Rodgers (Google him now!). The video is currently the feature story on the site showing the main film (see below) and behind-the-scenes stories. It definitely adds a lot of ‘punch’ and ‘attitude’ to ‘the BMW Brand’ and encourages people to add their stories all the more – giving off energy and a ‘just do it’ attitude. Not only that, it is trying very hard to appeal to the 2 and 3 series segment audience to consider them over Audi. 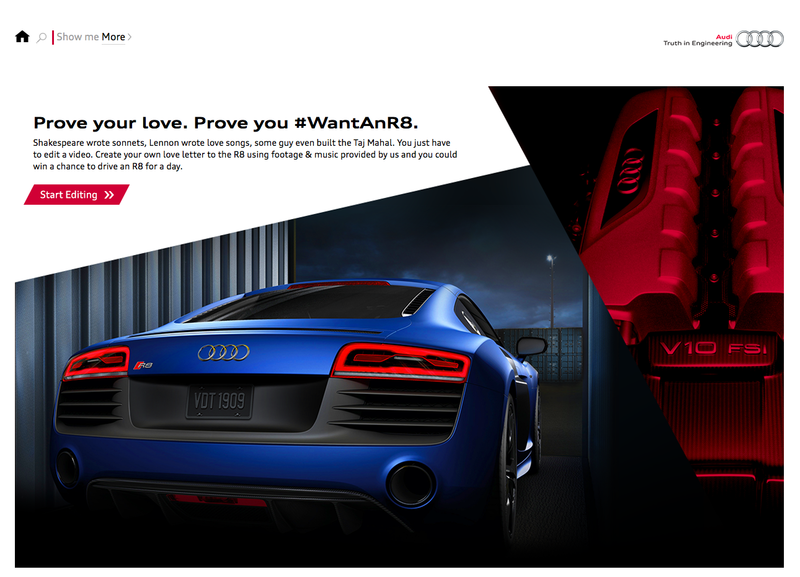 The call-to-action sends viewers right to the configurator to visualize and learn about all the features available or to the detail page for those who want to read before they take any other serious action showing interest in the model. The film has received about 12K likes on the BMW Global Facebook fan page. Volkswagen’s ’40 Years Golf’ is an even richer story telling experience online as per the title, as it allows Volkswagen to tell the story via a timeline. The timeline is in a grid format showing a range of beautifully designed and placed static and animated visuals. The interactive timeline allows viewers to learn facts, answer a question, watch a video, listen to sound clip, enlarge an image, read a story and share the content online via Facebook, Twitter and Google+. The icons like ‘settings’, ‘star’ and ‘number 1 badge’ share interesting facts from the respective year adding an element of surprise. Storytelling is very much ‘owned’ by Volkswagen and they are sharing what they ‘would like us to know’. However, this is not the case for ‘The Peoples Film’ campaign in New Zealand. ‘The Peoples Film’ is a campaign solely dedicated to the owners and their stories are at the heart of the campaign – in fact, they are the champions of the campaign and not a particular model. The video shows a time lapse of the owners and models till date and looks so natural – it does not try to sell you anything. It purely celebrates ‘the drivers’ of Volkswagen over 60 years and shows how each generation enjoyed the Volkswagen days. The website is also pretty simple and shows the main content that is a part of the campaign. There is not a single image of the latest model being promoted in New Zealand – a very refreshing approach to let the drivers of Volkswagen be the heroes here and a subtle call-to-action to explore the range is shown, as a standard approach. To add your story, all you have to do it share your local New Zealand region, the model of your car and the year. 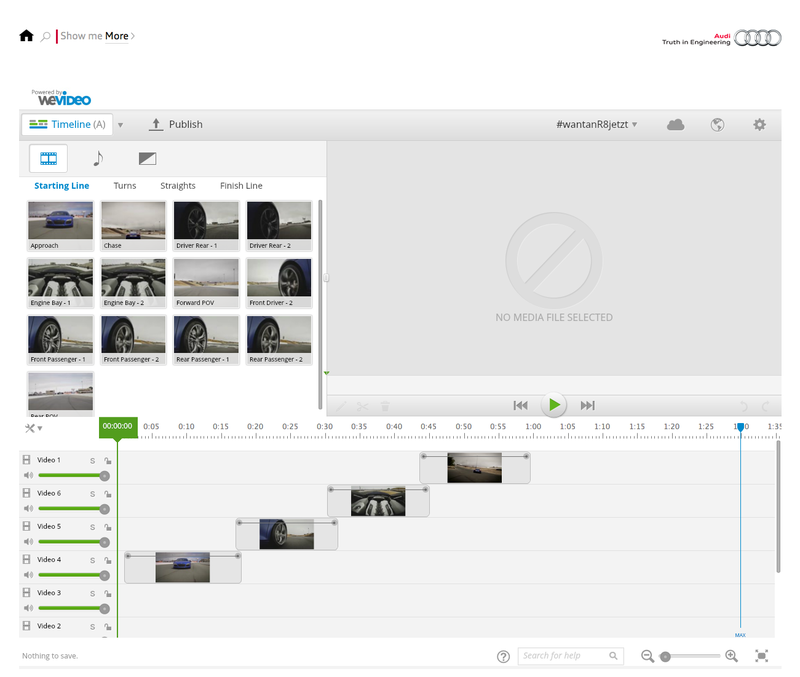 The story can be shared via a video or image and drivers can leave some comments about their story. Once the story is accepted and approved, the driver’s name is added to the list with their model name and year. The Facebook post promoting the campaign is very well written with a subtle tone of voice, thanking the drivers and celebrating their contribution over 60 years. Storytelling via user generated content, owned content and crowd sourcing is a pie everyone is trying to own and champion. Even though Porsche has not updated its ‘Porsche Everyday’ website – made in 2011 – it is still winning in terms of the online experience and user experience is pretty valid as per the online behavior today. The landing page begins with a beautiful message – the call-to-action and purpose of this website. When the site loads, you are given various options – to read about stories from different topics like ‘Magic’, ‘All Weather’, ‘Comfort’, ‘Usability’, ‘Safety’ and ‘Efficiency’ – clever way to label them from a benefit/feature point of view. The side bar allows you to chose what story you want to see from the main subject of interest – it could be an ‘Everyday Story’, ‘Heritage Story’ or ‘Product Story’. On selecting the story of interest, it opens up as a pop-up and also shows what related stories are available under ‘See more’ below the content and even ‘LIKE’ and ‘SHARE’ them online. Stories can also be filtered model wise. There is also an option to upload your own story in form of a video or an image. Even though we see 4 different cases here, we learn that it is absolutely important to respect the interface design ethics in digital and cut the clutter out. A lot of brands desperately try to add too much information and too many buttons on the site. That does not help and leaves the people confused. And when using user generated content, it is absolutely essential to ensure that the user is made the hero of the site and the campaign, and not let the product steal the limelight – there should be enough room to intrigue the users to find out more at their own pace and area of interest. I bet if Lamborghini opens this ‘Share your story’ door – we will see some really interesting and unforgettable stories. Hope you enjoyed these for the time being! Porsche ‘Blind Trade’ does not guarantee a Porsche for everyone. That’s the dare. So are people brave enough to let go of their current luxury car and blind trade it for a possibility to get a Porsche? Yes, seems like there are many of them out there. Internet tells me around 2000+ people traded-in their car in the first few hours only, gambling to win a Porsche. The campaign microsite reveals a new feature of the Porsche every 2 days and will be live for at least 3 weeks until the reveal – announcing the winner on the 31st March’14 who will proudly walk away with a brand new Porsche and converted into a loyal customer on that very day.